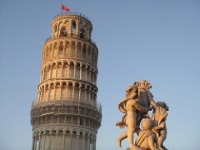 A popular day trip from Florence, the famous town of Pisa is most well-known for its leaning campanile. However, other equally notable coups include its long maritime legacy, dating back to 1000 BC, its prized university, and its status as the birthplace of the world's greatest physicist and astronomer, Galileo Galilei. The Pisans also created one of the most beautiful squares in the world in the Campo dei Miracoli (Field of Miracles). Pisa's key component is the famous Leaning Tower, whose layers of heavy marble were constructed on a shifting subsoil foundation that has been the bane of Pisan engineers for more than 800 years. It seems that the tremulous soil underneath the Field of Miracles has exacted its price on the other buildings too, most notably San Michele dei Scalzi. The leaning tower is well worth a visit - don't leave without the obligatory funny photograph! Pisa is home to dozens of other historical churches and buildings. Attractions of interest include the Museo delle Sinopie, a museum containing a display of sketches from the frescoed cycle that decorated the walls of the Campo Santo cemetery; and the Museo dell'Opera del Duomo, in which exhibits of arabesque panels and Corinthian capitals reveal the influences of Rome and Islam on Pisan architects. The Museo Nazionale di San Matteo displays a range of Florentine art from the 12th through to the 17th century. Pisa is relatively easy to get around, and most attractions are within walking distance of the city centre. It is recommended to hire a car however, as Pisa makes a great base for exploring other cities in Tuscany, including towns like Lucca and Calci.